Combine milk, light cream, sugar, cinnamon, and nutmeg in a saucepan and stir well. Cook over medium heat for 2 minutes, or until sugar dissolves (or you can heat in the microwave, in a medium size microwave-safe bowl with a lip, for 45 to 60 seconds). Remove from heat and stir in hot coffee and vanilla (you can taste it at this point and if you’d like it sweeter, add more sugar). 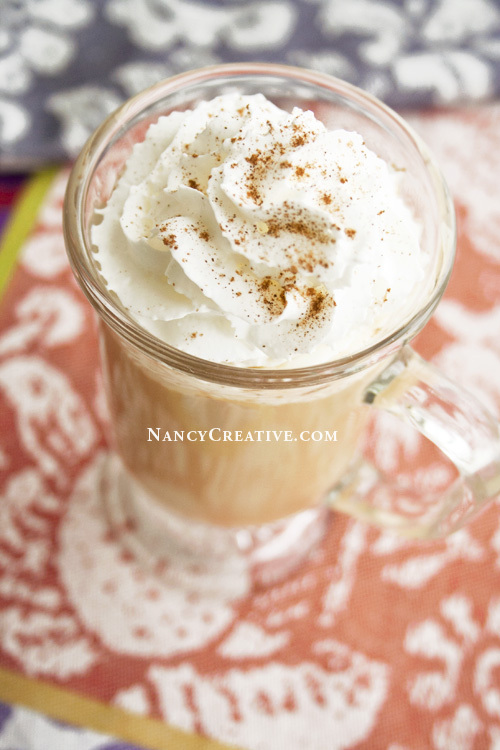 Pour into coffee mugs; garnish with whipped cream and a light sprinkling of ground cinnamon, and serve. You may notice that the cinnamon and nutmeg won’t totally dissolve in the coffee as you’re making this, but that’s okay–just blend it as well as you can. I think the whipped cream topping with the additional sprinkle of cinnamon really makes this special–and you can use light whipped cream if you’re watching calories. What’s your favorite flavored coffee drink? Do you make it yourself or get it from a coffee shop? This entry was posted in Beverages/Smoothies, Food and Recipes and tagged caffine, cinnamon, coffee, coffee drink, flavored coffee, Nutmeg, Vanilla on February 6, 2014 by nancyc. Thanks for the recipe. I like trying new coffee drinks either at home or at the coffee house. I love the warm spices in this drink. This one will be a keeper! I’m a huge coffee drinker. I usually get two cups in before I leave for school, and then more throughout the day. This coffee drink looks absolutely delicious!! Sounds delish! I could use a cup now as we are finally having our first rainy storm! Amazing! It has always been in the back of my mind to try this. I will now! I have tried coarsely ground fresh coriander seeds in my coffee a few times. This particular combination aids digestion. I’ve never tried coriander in coffee, but I’ll have to try that–it’s good to know that it’s good for digestion! Starbucks would be selling this little wonder at 5 US dollars for a tall, at least.